This rustic and sophisticated cabin is nestled on a mountainside near the French Broad River. It is located on nine private acres secluded from the Partridge Hill main house where the owners live. Partridge Hill was once owned by the author Hamilton Basso who was a close friend of Thomas Wolfe. Wolfe and Basso spent many hours on Partridge Hill and would love the inviting ambience of the cabin known as The Partridge Nest. The cabin features two queen-sized bedrooms and two full baths with an additional sleeping area in the cozy writers loft. Amenities include a beautiful and well-stocked kitchen, dining area, wood-burning fireplace, and a full screened porch with a mountain view. The interior design is comfortable, inviting, and mountain inspired. Forest is just minutes away from your front door and offers some of the finest hiking, rock climbing, and fly fishing in the East. Majestic waterfalls are all around the area as well. The Brevard Music Center is renowned nationwide for it's summer musical presentations and it's students typically go on to major careers in music. Keith Lockhart is the artistic director and principal conductor. You will forget time as you sit on the old-fashioned porch swing enjoying the mountain view or reading a book in the cozy loft. You will return to the real world rested, renewed and looking forward to your next visit to The Partridge Nest. The Partridge Nest was featured in the February 2018 issue of OUR STATE magazine in North Carolina. There are several pictures and a very informative story. Master bedroom bath has shower---Upstairs bedroom bath has bath tub with shower. Beautiful view back across the Blue Ridge mountain valley. All beds completely made up on check-in. There are two queen beds(one in each bedroom)and a single built-in bed in the dormer,46 inch flat screen HD television. We had a great vacation--such a beautiful area and spot--and the cabin is lovely. Only one complaint...there were some insect droppings in the house. The host said he would see to it right away though. The Brendles were a lovely pair. We really enjoyed our stay there. It was a wonderful place to relax and get away. The cabin is exquisitely manicured and inviting, a large comfortable bed by a window with a great view and the sound of rain drops on the roof cradles you to sleep in the warm soft bed of the cozy loft. Every corner in the cabin has a pleasant surprise. Enjoy the breathtaking view of the Blue Ridge Mountains from the covered porch furnished with a swing that makes you feel like you are floating on the clouds, comfortable rocking chairs and more....Take a little stroll outside and around the bend to a beautiful landscape and the relaxing sound of a small natural spring by the roadside. The landlord is friendly, welcoming, and shows great interest in his clients. One stay is not enough to enjoy everything this cabin has to offer. Beautiful decor -- antiques, unique whimsical knick-knacks, handmade items, tons of books and magazines, DVDs, games, and activities. Even if our family had spent the entire 3 days indoors, we still couldn't have exhausted all of the stuff to do inside the cabin. It has a cozy atmosphere with lots of natural light. The owners are so thoughtful that they left us fresh flowers and pretty plant clippings from the huge property in vases throughout the house. Speaking of the property.... this is nestled near a road, but just far off the road that you feel "away from it all." My children were able to explore the natural world farther than I'd ever let them go away from my home's front door. We are always happy when our guests leave with such good feelings. Our intent with The Partridge Nest is for guests to have a memorable and enjoyable experience. Great property !! Will for sure return. 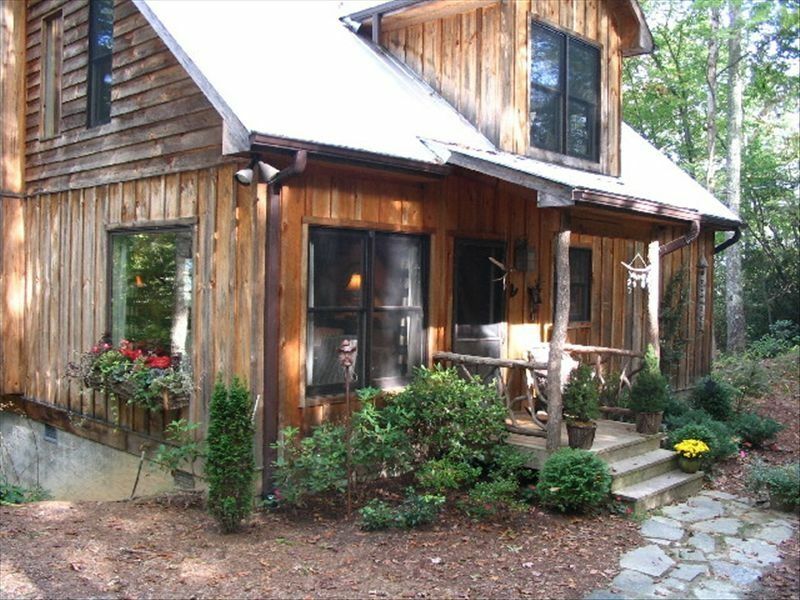 Property is perfectly located for sites, restaurants, hiking, and other activities around the Brevard and Pisgah Forest area. The cabin exudes charm and comfort. My family loved staying at this cozy, charming, and comfortable cabin. The details inside and out are amazing! We spent a lot of time on the screened porch playing checkers and rocking in the swing. Perfect location to Pisgah Forest where we did a fabulous day hike and downtown Brevard where we enjoyed a nice dinner out. Charlie the owner was a pleasure to work with. Hope to book again in the future! Horse boarding available directly across the road from our cabin. Barn and pasture included. Call us for details. Free use of tennis courts at near-by bed and breakfast upon request. Rates are for the use of both bedrooms. One bedroom rate is $50.00 less. Rates are subject to change until confirmed. No deposit required.